COLONEL HATHI PRODUCTION CEL WALT DISNEY STUDIOS GOUACHE ON CEL, 1967. Original hand painted production animation cel of Colonel Hathi from "The Jungle Book, " 1967, Walt Disney Studios; Set on a lithographic background; Unframed. "The Jungle Book, " 1967 was the nineteenth animated feature film produced by Walt Disney Productions and inspired by Rudyard Kipling's book of the same name. The film was directed by Wolfgang Reitherman, it was to be the last film that was worked on by Walt Disney, as he passed away during its production. The film follows Mowgli, a feral child raised in the Indian jungle by wolves, as he encounters Bagheera the panther and Baloo the bear; who try and convince him to leave the jungle before the villainous tiger Shere Khan finds him. Voice actors include: Phil Harris, Sebastian Cabot, George Sanders and Louis Prima; as well as Disney regulars such as Sterling Holloway, J. Pat O'Malley, Verna Felton, and the director's son, Bruce Reitherman, as the voice of Mowgli. Colonel Hathi is an Indian elephant and the leader of an elephant herd that he marches through the jungle in a military squad formation. Haiti (which means elephant in Hindi), speaks with a British accent, was at some point engaged in fighting in the Maharajah's 5th Pachyderm Brigade, and was awarded the Victoria Cross for bravery above and beyond the call of duty. Colonel Hathi has a wife named Winifred and a young son named Hathi Jr. Colonel Hathi was animated by John Lounsbery and voiced by the great Walt Disney voice actor J. 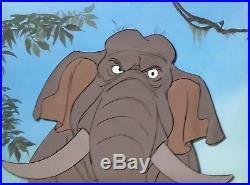 This is a wonderful original production animation cel of Colonel Hathi. A fantastic face on portrait image with both eyes open, and his trunk and two large tusks clearly visible. 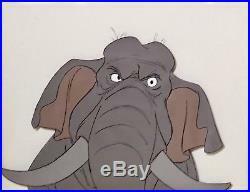 A very expressive image of the great pachyderm that is perfect for any animation art collection! Measurements: Size - Colonel Hathi: 6 3/4" x 9 1/2", Image 8 x 10. Condition: See pictures below of the actual cel, which is in excellent overall condition as shown by the pictures below! All items we sell are from a smoke-free/mold-free home/workplace and are in excellent condition unless otherwise noted. I own every work pictured for sale and I stand behind every item. Please follow/bookmark me as a favorite and keep and keep checking back for more items for sale in the coming weeks. For now, please check out my other Drawings and Cels and other original modern and contemporary artwork for sale! The item "1967 DISNEY JUNGLE BOOK COLONEL HATHI ELEPHANT ORIGINAL PRODUCTION ANIMATION CEL" is in sale since Tuesday, February 06, 2018.